After spending years expanding Lofty Pursuits and learning the skills needed to produce Victorian-style candy, Greg Cohen turned his planning to marketing. Of course, he had been marketing his business all along; it’s how it survived for so long and through several big changes. However, the rise of social media meant there was a new way to bring Public Displays of Confection to the masses. 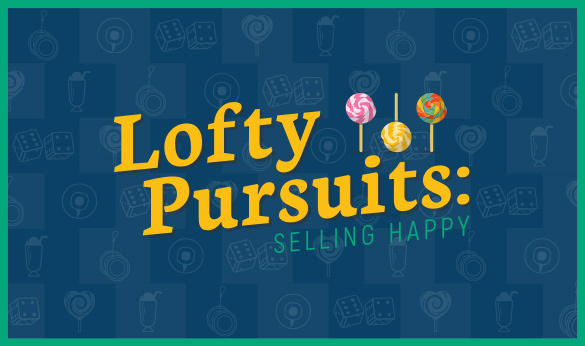 Even if you don’t live near Tallahassee, Fla., it’s possible this blog series isn’t the first time you’ve heard of Public Displays of Confection, the candy brand produced by Lofty Pursuits. That’s because a few years ago, Cohen got the idea to start filming himself making candy, and the internet responded by spreading the videos across social media. “It seemed to be the logical thing to do to spread the love,” says Cohen when asked about why he started making videos. Of course, there was a business impetus there, as well. While views came in slowly at first, they soon picked up steam. Cohen soon realized that posting the same type of video repeatedly didn’t make sense, so he decided to change things up. Because most of Cohen’s videos are about Public Displays of Confection’s image candy, many of the stories relate to the image being created in the candy. For example, if you watch the Honey Crystal Sunflower Candies video, you might learn some interesting facts about sunflowers. Despite all this planning, it’s difficult to predict which videos will achieve “viral” status. As Cohen found his style in making candy videos, he stumbled across an accidental recipe for success. “I read all the ‘how to make YouTube videos:’ close, face talking to the camera, loud, high-energy, concentrate on the person,” says Cohen. However, he didn’t think that style would work for him. While the number of views his videos receive results in ad revenue, that wasn’t Cohen’s main consideration when he started posting. When it comes to marketing, the videos posted by Lofty Pursuits have certainly served their purposes. Cohen doesn’t rely solely on his videos to spread the word of Lofty Pursuits. Perhaps due to his background in marketing, he has strong opinions about what brings in customers. That marketing philosophy influences how Cohen approaches running his business. But how does that philosophy of fun translate to marketing? Cohen points out that bringing ice cream to the masses isn’t quite as easy as it used to be. Cohen found his answer in an unusual place: a marching band sponsored by Lofty Pursuits. Cohen buys damaged instruments and fixes them using his metalworking skills, and sometimes paints them – Tubas mounted on the walls of the soda fountain are decorated with roses, the Grinch, and Boba Fett falling into the sarlacc pit. This is the second installment in a two-part series about Greg Cohen and Lofty Pursuits. We posted the first part of this series, Unusual Origins: Lofty Pursuits, on February 28.